Fibromyalgia is a neurological disorder that affects approximately 12 million people in the U.S. This chronic disorder causes aches and pains in the body that are severe enough to impact normal activity and disrupt sleep. A person with a fibromyalgia diagnosis may feel pain in the muscles, tissues, joints, and tendons in different areas of the body. Along with these physical symptoms, people suffering from fibromyalgia also experience mental issues as a result of fibromyalgia, including depression and anxiety. Fibromyalgia can also cause deep fatigue and exhaustion, even with very little activity. Even with so many people suffering from fibromyalgia, it remains a difficult disorder to diagnose. 1 of the most valuable tools for a fibromyalgia diagnosis is the tender point count. 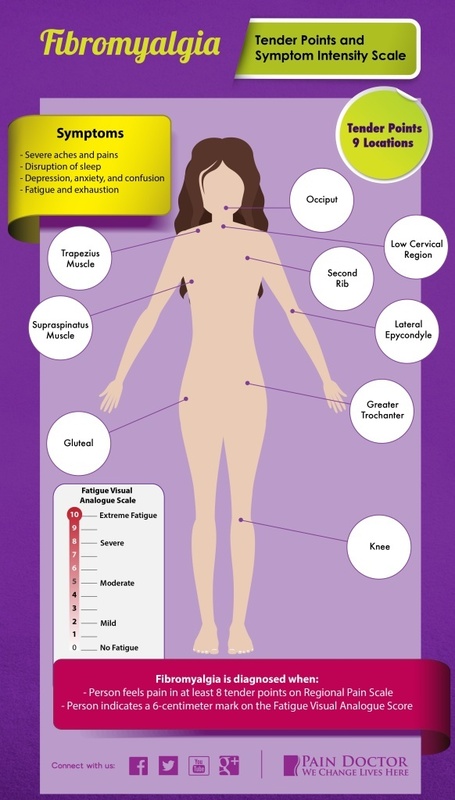 Although most of the population has a spot or 2 on their body that may be more sensitive than others, people with fibromyalgia often experience excruciating tenderness in very specific locations that are spread across their body. Tenderness is generally mirrored on both sides of the body and is located at 9 specific places on the body. These 9 areas are also sometimes called tender points or tender spots. Because fibromyalgia cannot be diagnosed with a lab test, counting tender points and taking a detailed patient history are often the best ways to get a clear diagnosis. Tender points are then rated on a Symptom Intensity (SI) Scale to get a diagnosis. The SI Scale was developed using survey results from nearly 12,800 patients with osteoarthritis, rheumatoid arthritis, or fibromyalgia. These patients located pain in 38 anatomic areas of their body and then also completed a fatigue visual analogue scale. The fatigue analog scale requires a patient to mark their level of fatigue on a 10-centimeter line on the day they identified their pain symptoms. Using both of these measures, the developer of the survey identified that those patients who already have a fibromyalgia diagnosis indicated pain in a common set of 19 places. These sites of pain were named the Regional Pain Scale. When patients experience pain in at least 8 places on the Regional Pain Scale and then also indicate at least a 6-centimeter mark on their fatigue visual analogue score, then a confident diagnosis of fibromyalgia can be made. In 2006, Frederick Wolfe and Johannes J. Rasker completed an evaluation of 25,417 patients using the Symptom Intensity Scale and found that it was the best and clearest diagnostic tool for fibromyalgia and also found that higher Scale scores also indicated increases in hospitalization, disability, serious medical issues, and death. Because of this relationship, the SI Scale can be used to measure overall health and also predict outcomes for patients with a number of diseases. It uncovers “hidden” illness that accompanies the presenting illness, such as depression or anxiety in a patient with rheumatoid arthritis. Before the Symptom Intensity Scale was developed in 2003, a fibromyalgia diagnosis was a tricky proposition, and uncovering the causes and risk factors remains just as complex. Although researchers agree that there is a neurological component to the disease, many previously believed that it was all in a person’s head. Some studies have pointed to risk factors such as a genetic predisposition to feeling pain more intensely. Other evidence connects the development of fibromyalgia to a stressful or traumatic event, repetitive injury, or other disease. Sometimes fibromyalgia has no clear cause or trigger and develops on its own. Women are 3 ½ times more likely to develop fibromyalgia as men, and people with certain illnesses already present may have an increased risk. Autoimmune disorders such as lupus and rheumatoid or spinal arthritis sufferers develop fibromyalgia at a higher rate than those without these conditions. Treatment of fibromyalgia is best approached as a team, with doctors, physical therapists, and other alternative practitioners working together to treat the physical and mental symptoms. Families also play an important role in the treatment of fibromyalgia. Suffering from an “invisible” but chronic illness such as fibromyalgia can be socially isolating. It is important that the family members are supportive of treatment and are understanding when their loved one needs to rest. The National Institute of Arthritis and Musculoskeletal and Skin Diseases (NIAMS) is sponsoring more research on fibromyalgia to better understand this disease, specifically in relation to causes and better treatments. For now, though, the best diagnostic tool remains the Symptom Intensity Scale with its assessment of specific pain regions and level of fatigue. If you have a fibromyalgia diagnosis, what tools did your doctor use? 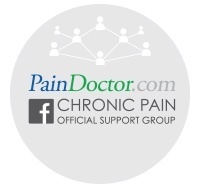 Pain Doctor was created with one mission in mind: help and educate people about their pain conditions, treatment options and find a doctor who can help end their pain issues.